Holcim El Salvador - PROJECT - FOSHAN LEADEX FURNITURE CO.,LTD. Holcim is built on a belief in idiosyncratic talent. They are looking after good quality and design furniture for their office plan. Introduction: LafargeHolcim is the leading global building materials and solutions company serving masons, builders, architects and engineers all over the world. Group operations produce cement, aggregates and ready-mix concrete which are used in building projects ranging from affordable housing and small, local projects to the biggest, most technically and architecturally challenging infrastructure projects. LafargeHolcim employs around 90,000 employees in more than 80 countries and has a portfolio that is equally balanced between developing and mature markets. Core demand: Holcim (hereafter this text will be abbreviated as HC) is built on a belief in idiosyncratic talent. They are looking after good quality and design furniture for their office plan. HC is extremely diverse and inclusive in recruiting talent. The first thing that designers think about is the environment they create, and whether it can help employees make significant progress in their work. Before they find Leadex, they already have a whole plan of the office. What they want from Leadex are right products matching with their environments. 1. The color and style should be in line with the head office. 2. The size of the product shall comply with the required size of the drawing. 3. A good balance in openness and privacy control. With specific requirements, it is easier for Leadex to recommend products specifically. There is no difficulty in solving the first and fourth points. 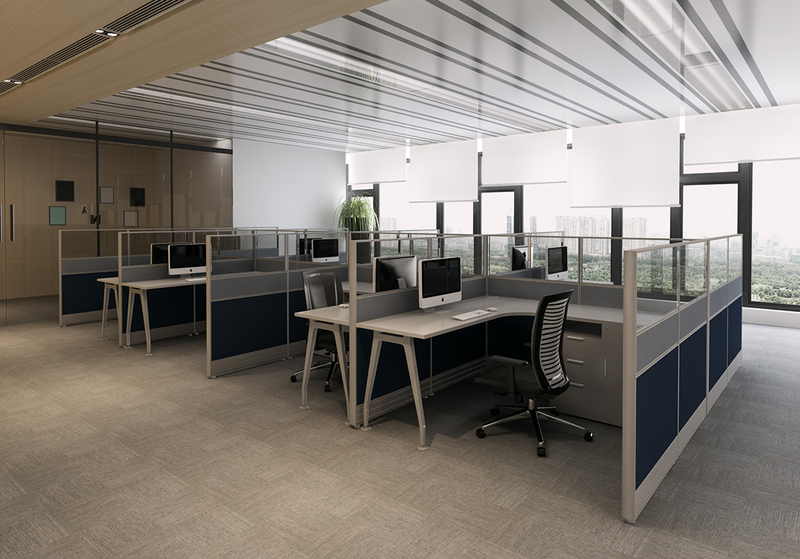 Leadex designers integrated HC requirements, using the MDS desking system with C60 screen system, made the first version of the renderings. HC has no objection to color, and the use of half glass screens is exactly what they expect. But the first draft is designed base on the Leadex’s standard products and sizes. So we can see drop between the swing door cabinet (D450mm) and the files drawers (D600mm). It is not perfect. *They canceled the open box, and replaced it by drawer. Leadex can meet the needs of different customers, integrate the best office space strategy into a series of innovative new office environment, and support the needs of a series of office space.